Overcoming the Challenges such as lacking experience or drawing ability etc. 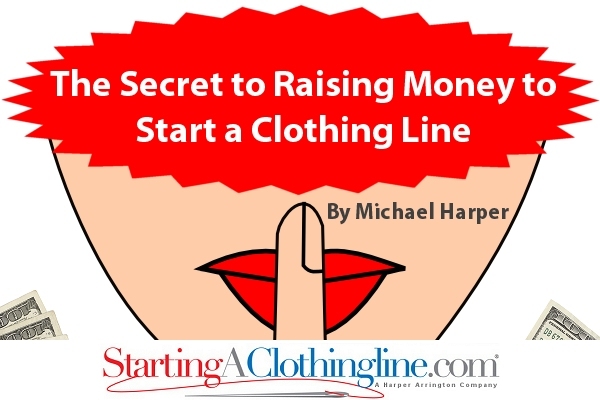 First let me say that I know this is a long article on the secret to raising money to start a clothing line. I apologize for the length. But I will say that if you read it all, my hope is that you will feel empowered and share it with others. You will know where you should start in terms of creating your own clothing line. I wish I could have made it shorter but I wanted to make sure I touched on all of the key points. I want to make sure you guys know that you have options. You no longer have to continue to let the things that have been holding you back or perceived personal shortcomings continue to hold you back. This article will go over how you can overcome all of your obstacles and go from aspiring fashion designer / beginner to creating and running your very own professional fashion brand. I have been working in the fashion industry for over 15 years now. It has been a truly wonderful experience overall from starting a clothing and now working at StartMyLine.com / StartingAClothingLine.com. Once upon a time, I had created a website and I wanted to make T-shirts for it. I used a graphics program I had purchased to create the artwork for the T-shirts. I contacted a local embroidery shop to make the T-shirts. I was probably ordering about 20 at a time or so. Realizing I needed a little help, I asked some friends and family to join in to help. Together we sold the T-shirts all over town. By that time, I had forgot about the website I had created. I became more focused on the Tees and starting a clothing line. Then one summer we decided we wanted to get a booth at a music festival that was coming to the city. We all took money out of our paychecks at our regular jobs to buy 750 T-shirts. We sold $15,000 worth of T-shirts during the 3 day festival at $25 a shirt. It was amazing and it felt really good. At that point, I started thinking that I wanted to do jeans as well. I didn’t think the name we were had at the time represented where I envisioned the line going. We all agreed and we changed the name and trademarked it. Our clothing line was born. But how would we get the ultimate funds / loan / investor to really start a full-fledged clothing line? I couldn’t really draw either but I was full of ideas. I was hand sketching my ideas out and manufacturers did not want to work with my hand sketches. They wanted computerized fashion sketches where they could see the detail etc. I developed a method of designing using the computer to create our clothing sketches. 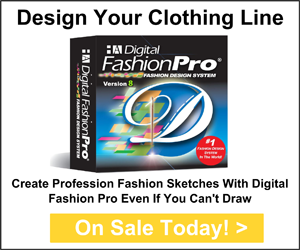 This fashion designing method would later become the foundation of Digital Fashion Pro. I realized why keep drawing the same silhouettes over and over just to add different designs to them. Back then, there was not a website like ours that had a detailed plan of action on how to start a clothing line, design it and work with manufacturers. Everything we were doing was by trial and error and believe me – we paid dearly for that. The cool thing is now our clients don’t have to start a clothing line by trial and error. You have our Official Step by Step Guide to Starting A Clothing Line Course. It will guide you through the path successfully as you get to take advantage of our direct fashion industry experience. The truth of the matter is I was just an aspiring fashion designer with an idea when we started our clothing line. I was not born rich nor did I have a wealthy family. I was just an ordinary guy with an ordinary job. The same can be said for our whole team at the time. So how did we get the financing to do our clothing line? There is a secret to it! The secret is you have to be willing to invest in yourself first. If you aren’t willing to invest in yourself then who will. My business partner Jay’s favorite saying is, “Don’t say you can’t afford something, you should ask yourself how can I afford it?” This means you have to be resourceful. Before I get into the specifics of funding a clothing line venture I will ask you to consider these statements. A few people have written us over time and asked how they can start their clothing line for free? Is anything in life really free? Well talk is. But besides that, there are few businesses that you can start without spending any money at all whether it is on start-up cost, inventory, business licenses, etc. If you have ever had this mindset, please look at starting a business differently. Again, if you aren’t willing to invest in you then who will. Another statement we have heard is what company will just make my clothing for me for free and I’ll just be responsible for bringing my grand design idea to them. I will not spend any of my money. I’ll let you take all the risk and I want the most proceeds because after all it is my idea. If you believe in this myth, please wake up immediately! No business works like that. This is the mindset of a person who is either unwilling or think they are unable to invest in themselves. No one will hold your hand for free so that you can potentially make millions of dollars all at their expense. It simply doesn’t work like that. Sorry. If it did we all would be rich because we all have ideas right? Think about it. If you were going to start a real estate agency. You would first have to pay for real estate classes and your real estate license. If you wanted to start a lawn service, you would have to learn a few things about lawn care and buy equipment. You get the point, there will always be a need for you to invest in yourself. You should be up to the challenge and realize that is your responsibility if you deem the dream you have worthy of chasing and achieving. Too many times people do not believe in themselves enough or make excuses as to why they can’t go after their dreams. Don’t let this be you! You can even compare getting investors for your clothing line to an artist seeking a record deal. Ultimately the record label is investing in the artist when they give them a recording contract. Who is more likely to get a record deal – the artist who walks into their office that sings really good or the artist that walks in, sings really good, has invested in their own professional demo, has invested in their own promo pictures, sold some CD’s / downloads, has their own website and has been out touring. You get the point. People love people who invest in themselves. We are all obsessed with stories of how entrepreneurs took matters into their own hands first and found success. You will be the next one with a success story! Why Would an Investor Want to Invest In Your Clothing Line? There are people everyday saying I want to start a clothing line or I have a clothing line. Let’s face it, we all know that talk is cheap. Investors want to see proof of concept. They want to know that you know what you are doing and what you are talking about. They want to see a business plan. 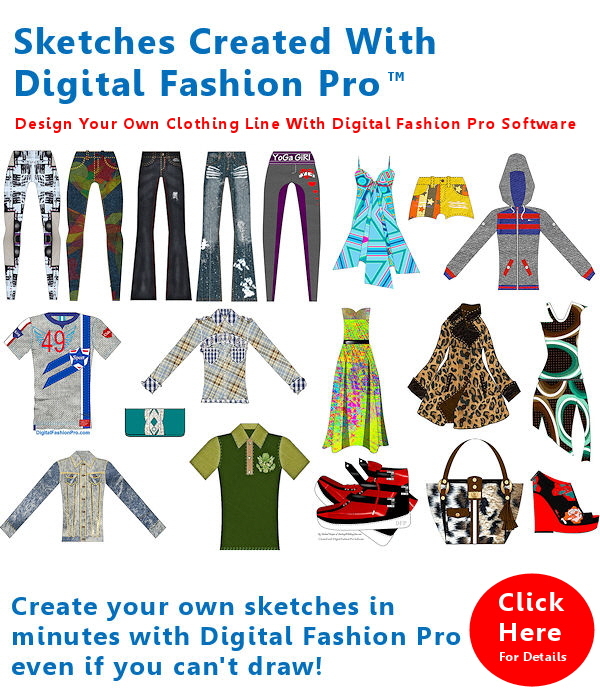 They want to see your fashion design sketches, your website and clothing samples. If you can sew great! If you can not sew don’t let that stop you. Just hire someone that can sew your designs like a seamstress, sampling service or get a clothing factory to make your samples. Now back to investors. They want to know how and when they will get their money back. They want to know your yearly projections. And more than anything they want to believe in you and your vision. The way to get them to believe and get excited is by doing everything I just mentioned above. You have to show them that you are ready and willing to make your clothing line happen. In reality, your clothing line start-up cost, has to come from you. The start-up cost I am referring to is you obtaining the fashion business tools and information that will give you the educational background to start a clothing line, design it, work with clothing manufacturers and ultimately get your line in stores. An investor wants to know that they will get their money back. They need to be able to trust that you know what you are doing. With that being said, trial and error would not be the best practice especially if there is help available. That is where the signature tools we offer can help you with creating your fashion label. Once you have say our Fashion Mogul Package + Spec Book for creating garment measurements you will be equipped to do all of the necessary background work to get your line going. You will be able to plan out your clothing line, get trademarks, create logos, create fashion sketches, find manufacturers, know how to work with manufacturers, know fashion jargon, learn how to design clothing, know how to create spec sheets, how much money you will need to start the clothing line, know how to effectively sell your clothing line to retailers, best practices for shipping your clothes to retailers, how to handle accounts payable, credit terms and much more. This package is deemed our Go From Aspiring Fashion Designer to Professional Clothing Line kit. You ever heard the old saying that banks only loan money to people who don’t need it? Why is this? Well for one because the people who don’t need a loan have the appearance / collateral / bank account that makes the banks feel like they will get their money back. The same is true of an investor to a certain extent. They want to feel like you are on your way and you just need a little help. They want to know that you know what direction you are going in. They want to know what your goals are and how you plan to get there. Therefore, trying to raise money without knowing about the fashion business and actually creating your own designs is a mistake. It is possible to get investors, we did, but you have to appear / actually be ready. So don’t say I want to start a clothing line but I can’t afford to start one. You can! You just can’t put the cart before the horse. Also when you talk to potential investors you want to be able to talk about what apparel factory will be making your clothing and a little about them. You want to be able to talk about how much you will be paying for certain styles and how much you will sell them for etc. To have this detailed information means you need to be operating like you have an actual clothing line even though you may not have ordered any inventory yet. All of this may sound like a lot, but once you know exactly what to do by following our proven plan it will become more simple. That is not to say there won’t be speed bumps but overall you will be able to execute starting your own clothing line with confidence. Remember you have to become a salesman to sell investors on your clothing line. Any great salesman knows that to sell effectively you have to know the ins and outs of whatever it is you are selling. How Do I Find The Actual Investors For My Clothing Line? When we were first starting our clothing line we funded the start-up cost out of our own paychecks from our regular jobs. We recommend you do the same. Collaborate with a few friends or family members to help you with the start-up cost if you can’t do it all on your own. Start-up cost again are the business tools you will need to adequately move from being an aspiring fashion design beginner to knowing about how the fashion industry really works and being able to create your own designs that are manufacturer ready. People / investors around us were so impressed with our designs, our samples, our name and what we had accomplished that they wanted to invest. People had been seeing our clothing on TV, in magazines and people wearing our clothing line around the city. We would get what we called “short term small investors.” These people would invest small amounts, say for us to pay for a small production run and would get their money back with a little interest plus free merchandise. These people were family, friends, friends of friends and co-workers. Now people want their hard earned money back so you better make sure again you know what you are doing. By starting out our clothing line small but having our business in order – a few pivotal events transpired. Prior to becoming an investor, a guy had purchased one of our offerings from a local store. When he wore the piece, he received a lot of compliments on it. Things happened and when we met, he told us the story of him buying one of our pieces and that he was a fan of what we were doing. Another time, we were at the Saddle Ranch Restaurant in Los Angeles, CA and a guy liked what we were wearing (our own clothing line) so much he offered to put us in contact with a few industry contacts. Again, none of these wonderful things would have came about if all we did was sit on our clothing line ideas. Instead, we chose to fight for our dream. You also have to make sure you have customers waiting for what you are making. We often had people even pre-ordering our clothing before we even made it because they had seen the design or actual clothing sample. All these are ways that you can finance your clothing line. Most investors are people with some type of ties to you. When you begin approaching larger investors is when you really have to know what you are taking about and have your business in order. These investors will be extra critical of your plan and they will want to see proof of concept. They will not ever be sold on just your idea alone. They won’t care that you have a hot idea for a clothing line. You can also use crowdfunding sites like Kickstarter and Indigogo to try to raise funds for your clothing line. Your clothing line start-up cost should not be a part of the money you are seeking. No one should pay you to learn what they already expect you to know. Not to mention, you have a moral responsibility to be as educated as you can be concerning starting a fashion brand prior to seeking investment. Plus only real research will tell you how much money to even seek. You want to be spot on in every aspect. Crowdfunding can work as long as you demonstrate a solid plan and have professional fashion design sketches, samples and prototypes to show.